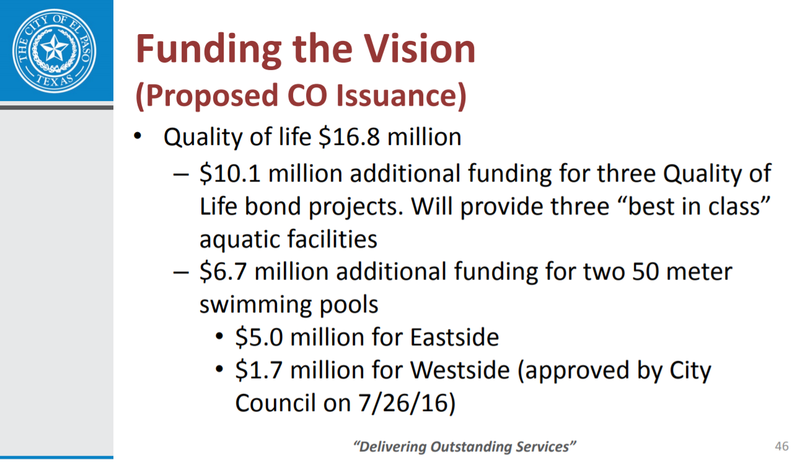 Most of knew in the beginning that the quality of life projects were poorly planned and that we would end up spending even more money than the $473 million bonds would fund. That’s right. They are going to consider issuing $16.8 million in certificates of obligation to finish part of the quality of life projects. This entry was posted on Thursday, July 13th, 2017 at 5:00 AM and is filed under City government. You can follow any responses to this entry through the RSS 2.0 feed. You can leave a response, or trackback from your own site. Tim Holt. I’ve make a nice living off of the EPISD scandal and any arcane information that’s even remotely associated with the EPISD. Did I mention that I got a Ben Bradlee award? The ONLY “Quality of Life” that ever improves in El Taxo, is that of POLITICIANS, Public Officials. School isn’t in session, Deputy Dawg. That is a breach of contract…simple as that. They city has failed to live up to their end of the contract to give El Pasoans various projects for an agreed amount of taxpayer dollars. Lawsuit. Thank Joyce Wilson. The current Council and Mayor have their hands tied. Thank you Brutus for going an entire week without an EPISD article. I do believe that is a record.